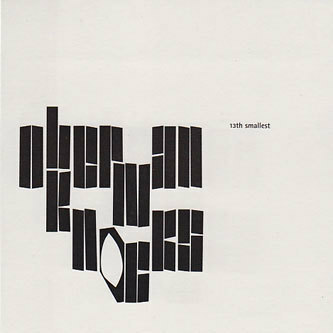 Exciting new prospects from Andrea Parker's newly minted Aperture imprint, dispensing its first CD release with Oberman Knocks '13th Smallest'. Born as a label for conceptual and experimental electronics, Aperture promises great things with this debut album of frozen soundscapes and post industrial textures from Oberman who has previously released on Static Caravan as Alkin Engineering. Moving stealthily into the kind of abstracted forms and stoic structures usually inhabited by Autechre or the Skam label, opener 'Bronic' is a creepy introduction to his world, with obtuse rhythm mechanics forming complex patterns to a backdrop of overcast drones and pressurised atmospherics. Working with a surprisingly limited setup of well chosen software, minidisc and a cheap microphone, Oberman crafts an impressively gnarled beast on 'Motor Sepple Freak' distinctly reminiscent of Ae's Chiastic Slide period, with the haunting addition of mangled vocals or on 'Indomine Rhittiger Plans By Four' an uncanny knack for lop sided rhythm construction to match his peers. 'Lackey Remind' churns up silicon with a fierce attitude, sending lumpen kicks docking with precise metallic surfaces and spacious arrangements, or slowing down to quasi industro-dubstep tempos on 'Anterbine On Hote'. For the furthest reaching dancefloors, 'Holtzen Anger Mire' could serve some purpose, finding a regular rhythm and passing it through ever encroaching walls of deconstructed digital tones for a intense floor experience. Needless to say, it's an engrossing listen from start to finish, placing the listener in an entirely artificial environment utterly devoid of any immediate emotional warmth or conventional sonic imagery. Ears attuned to Autechre, Ben Frost or the Digi-Jap sound of NHK or Atak records will probably find a new hero here. Highly Recommended!